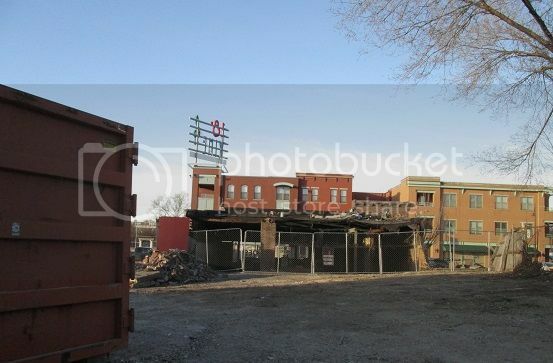 The building on the SE corner of 18th and Paseo is being demolished. A fire has severely damaged three historic and vacant buildings in the Jazz District along Vine Street. In one of the articles, I found a link to a mockup of what the redevelopment might look like. It looks like the City is stabilizing these buildings for redevelopment despite the fire damage. Photo taken Thursday, Feb 16, 2017 of fire-damaged buildings being stabilized. This church on the east side of Paseo, and south of 18th Street, in the Jazz District had its' roof blown off in last night's storm. I noticed on Monday that there was scaffolding on the vacant former Water Department building on Vine Street, and also workers going in and out of the structure. Does anyone know what is going on? I thought it was owned by the same guy who owned the work house. There are pdf files with their proposal for reuse. It doesn't appear to be the same owners as the KC Workhouse building. 2000 Vine Street LLC is headed by Timothy Duggan, who is also an owner of Phronesis Design. 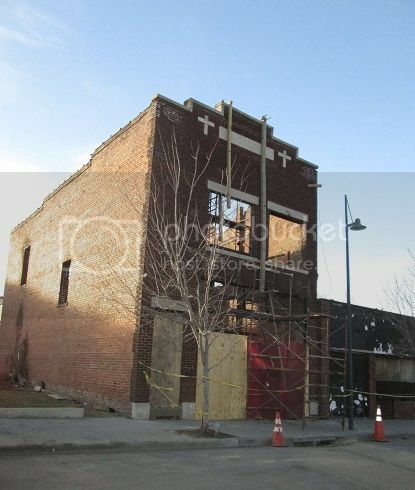 It appears that the buildings are going to be restored as offices for three small professional firms: Phronesis Design, an architecture firm; Parsons & Associates, a public relations firm; and Benton, Lloyd & Chung, a law firm. 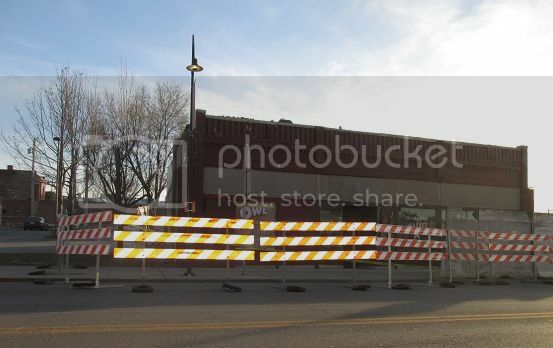 I saw workers taking stuff out of the Boone Theater on the SE corner of 18th and Highland. Perhaps they are preparing for work to start on renovation. In addition, the fake storefronts to the east of the theater building have been removed. I don't know when that happened. The Crossroads Academy hopefully has found a new permanent home for its downtown high school, the long-vacant, historic Attucks School in the 18th & Vine Jazz District. The charter school has submitted a bid to the city to buy the old building at 1815 Woodland Ave. If accepted, it could ultimately house 500 high school students attending the expanding Crossroads Academy program. The Crossroads Academy will not open a new high school in the former Attucks School building. It will be redeveloped into an arts hub. The Zhou Brothers, ShanZuo and DaHuang, plan to create a Kansas City version of their Zhou B Art Center in Chicago. 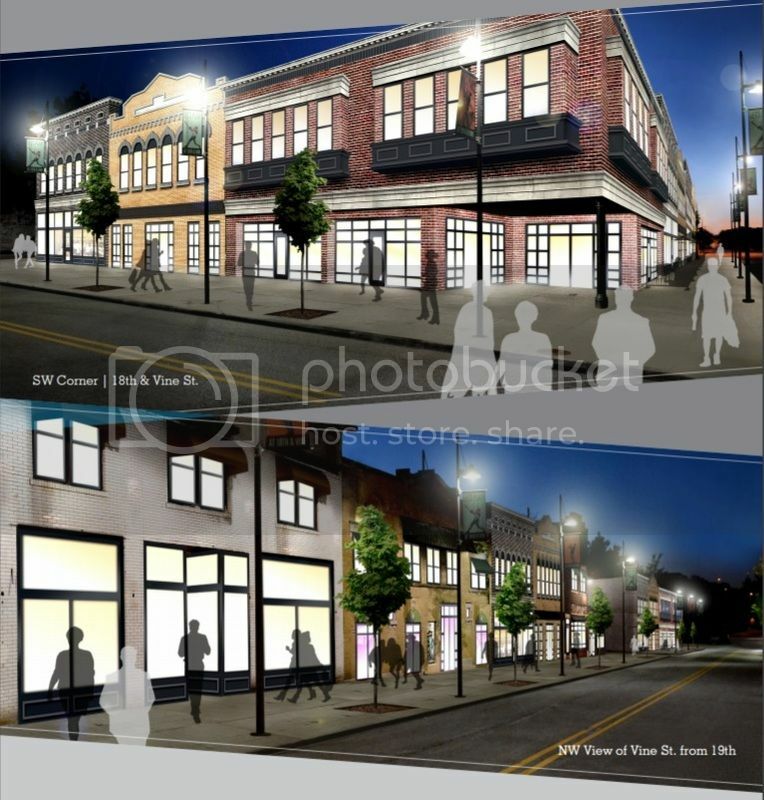 The plan includes gallery and exhibition space, live-work space for artists and other arts-related uses. An entire city block along the strategic 18th Street corridor between the Crossroads and 18th & Vine Jazz District will be offered soon for development by the Kansas City Area Transportation Authority. 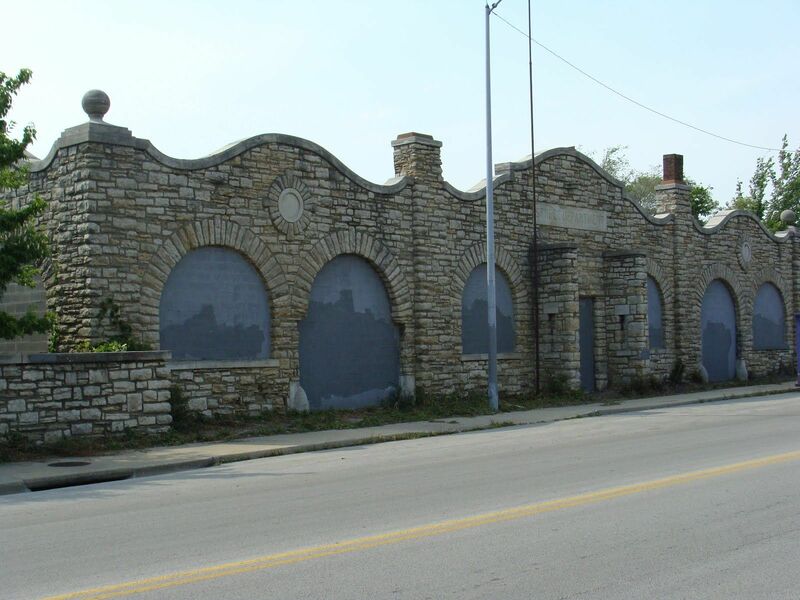 The block on the north side of 18th between Troost and Forest is currently a greenfield and is expected to be pitched by the authority as a potential residential project with lower-level commercial space. This block may one day help form a vital connection between Crossroads and 18th and Vine, but I think that a lot more development in Crossroads will have to happen before this land looks attractive to developers. There are too many development opportunities in Crossroads. On the other hand, this is a greenfield site with an owner looking to sell, unlike a lot of surface lots downtown. I estimate it will be 5+ years before we even hear anything else about this site. It seems something like the gallerie that they are doing at 27th and mcgee would be perfect here. The crossroads and 18th and vine are super close together, they just feel far apart. 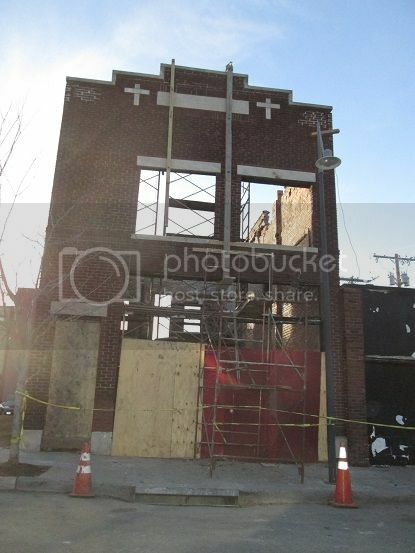 FangKC wrote: This church on the east side of Paseo, and south of 18th Street, in the Jazz District had its' roof blown off in last night's storm. I noticed today that the repairs are finally be made on the roof that blew off in last March's big storm. 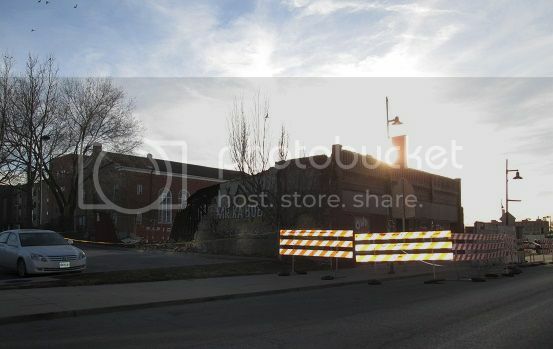 The link below has a video showing work being done on the exterior of the Boone Theater on the SE corner of E. 18th and Highland. Towards the end of the video there is footage of the interior of the building. I didn't realize the roof was in such bad shape. It's not so apparent from the outside, but when you see the sunlight streaming into the darkened theater, you can see what I'm talking about. That constant trickle of water while walking around inside is just eerie.